A Dragons student and monk playing badminton. Photo by Eric Jenkins-Sahlin, China Language 4-week. Experiential Education involves the use of hands-on exercises that engage multiple senses and learning styles. [description] => Featuring the words, projects, guidance and vision of the community of incredible staff that make Dragons what it is. [category_description] => Featuring the words, projects, guidance and vision of the community of incredible staff that make Dragons what it is. [post_content] => God bless parents, especially moms. At least, especially my mom. Just after I turned 24, in 1992, I returned to my parents’ home in Missoula, Montana, USA, after having spent the academic year teaching English in a medium-sized industrial city in the far, far northeast of China. “Reverse culture shock” is a term I may or may not have heard before that homecoming. Either way, I was utterly unprepared for what was about to hit me…and my mom. “Reverse culture shock” is a term I may or may not have heard before that homecoming. Either way, I was utterly unprepared for what was about to hit me…and my mom. I was rude, insensitive, and sometimes even cruel to my mom, who only wanted to welcome her son home and make me feel at home. Nothing she did was enough for me. She tried to empathize, she tried to nurture, she asked questions. Nothing worked. I was just too jumbled. My case may be extreme, but I know that the general sense of instability, of not feeling quite right, is common for people just back from big adventures in new places. And it turns out that the brain has a lot to do with it. How could the dot just disappear like that? It turns out that each eye has a blind spot, where the visual field is blank. The retina gets no information from this part of the visual field. Why don’t we see some kind of hole or emptiness where the blind spot is? Because the brain invents something to “put” there—in this case, the color or pattern of the paper around it. Volumes of evidence from vision experts have proven that the world we see is a massive illusion. How does this work? The brain just invents it. Volumes of evidence from vision experts have proven that the world we see is a massive illusion. Just twenty percent of visual information comes from the retina; the remaining eighty percent is pure fiction, manifested by the brain in order to create a sense of coherence. Think about that: four-fifths of what we see is just the brain’s best guess. It’s not actually there. I love this simple exercise because it gets right to the heart of two key issues when it comes to human identity. First, reality is a product of our own brains, based on our particular set of experiences. Second, our brains have a primal need to create coherence. They are doing this constantly, in the background, completely out of our conscious awareness. Another thing our brains do all the time, automatically, is warn us of threats in the environment. One part of the brain in particular—the amygdala, or “lizard brain”—gets highly active when it thinks we’re being threatened. And when the amygdala is active, it inhibits activity in the prefrontal cortex and other parts of the brain that govern our “higher” functions. The amygdala is fast but coarse: it knows nothing about nuance or subtlety. In one important sense this is a good thing: it keeps us alive. If a tiger jumps out of the bushes, we really don’t have time to consider the tiger in all its uniqueness. We just need to know right away that it’s a tiger and that it’s dangerous. The problem is that the amygdala does its thing even when we don’t need it to. It sees almost anything new as a potential threat, and since difference is a form of novelty, we tend to see people different from us as threatening. This leaves us with a rather bleak picture of humanity: If our brains are busy inventing coherent realities about the threats posed by groups of “other” people, then we don’t stand much of a chance of getting along. And isn’t this, when it comes down to it, the story of humanity’s dark side? Now for the good news: we can relate to difference in ways that aren’t dominated by threat. It just takes a lot of awareness and hard work. We can relate to difference in ways that aren’t dominated by threat. It just takes a lot of awareness and hard work. When I returned from China in 1992, I had a lot going on in my brain. During my year in China, my brain had started out in full-on threat mode, reacting negatively to the confusing behaviors all around me. Over then next nine months, my brain gradually created a sense of coherence, as I began to understand all the new patterns I was seeing, and to empathize with the people around me. I was starting to understand why people did what they did, and even though it was different from what I was used to, I could at least see the logic. New worlds were opening up to me, and it was thrilling. I was a new person in a new world, eager to return home and share my bounty. But when I came home I found a place that looked exactly as it always had, inhabited by people whose worldviews hadn’t budged an inch. The “mistake” I made is a common one for returnees from abroad: I had replaced a single view of the world with a different, single view that I’d judged to be better than the “old” view. The “mistake” I made is a common one for returnees from abroad: I had replaced a single view of the world with a different, single view that I’d judged to be better than the “old” view. And this is where the brain’s good news begins to come in handy. Thankfully, we’re not slaves to the amygdala and to our brain’s tendency to create a single, coherent story. As humans we have the ability—thanks to the prefrontal cortex and other more recently evolved regions of the brain—to see the world from multiple perspectives. And it turns out that this is the key to reintegration—indeed, to what reintegration is all about. Joseph Campbell wrote, “‘The Cosmic Dancer,’ declares Nietzsche, ‘does not rest heavily in a single spot, but gaily, lightly, turns and leaps from one position to another.’” We don’t have to fear “other” ways of being. Fear is natural, but we don’t need to let it rule us. What we need is to thank our amygdala for keeping us alive, and to ask it to please quiet down while we listen and look for what there is for us to learn. What we need is to thank our amygdala for keeping us alive, and to ask it to please quiet down while we listen and look for what there is for us to learn. We all can, in Walt Whitman’s famous words, “contain multitudes.” Indeed the future of our species depends on it. So let’s keep asking, keep reaching, keep learning. JASON PATENT, Ph.D., is a leading cultural interpreter on China-related issues and previously served as American Co-Director of the Hopkins-Nanjing Center for Chinese and American Studies in Nanjing, China. He is a former Dragons instructor (China ‘98-’01) and co-founder of the Dragons China Semester Program. Currently Jason is Chief of Operations and Director of the Center for Intercultural Leadership at UC Berkeley’s International House. He lives in the Bay Area with his wife, Colette Plum, and their two daughters. [post_excerpt] => "God bless parents, especially moms. At least, especially my mom. [...] “Reverse culture shock” is a term I may or may not have heard before that homecoming. Either way, I was utterly unprepared for what was about to hit me…and my mom." [description] => Archives of The Dragons Journal (formerly known as the Map's Edge Newsletter). [category_description] => Archives of The Dragons Journal (formerly known as the Map's Edge Newsletter). Selected by peers, family, friends and strangers via Facebook, we're excited to announce the winners of Dragons Fall 2017 Photo Contest (featuring our Nepal Semester, China Semester, and South America Semester). Be sure to visit the WTBD Facebook page to view photos and captions from all of our finalists! [post_title] => Photo Contest Winners from our Fall 2017 Gap Year Programs! [description] => Announcements on: New Programs, Surveys, Jobs/Internships, Contests, & Behind-the-Scenes Activity. [category_description] => Announcements on: New Programs, Surveys, Jobs/Internships, Contests, & Behind-the-Scenes Activity. Photo Contest Winners from our Fall 2017 Gap Year Programs! The search for a perfect summer or semester program provider can be overwhelming. Every good project starts with great questions. How many years have you been running international programming for students? What is the maximum number of students in each of your groups? What is your ratio of instructors to students? What are the typical professional qualifications of your staff? Do your instructors speak the local language? What tools do you use to facilitate reflection and dialogue on course? What’s the average age of your instructors? How many of your staff return year after year? How do your proactively manage risk on course? What type of emergency response team is on-call at your offices? Are itineraries fixed before the program? Are they the same from season to season? How do you foster a safe student dynamic? How do you define ethical travel? How do you approach the theme of “service” and manage the dangers of “voluntourism”? How do you manage the sustainability of your programming on local communities? How do you help students apply what they've learned abroad at home? What does your financial aid program look like? Can you put me in touch with an alumni student? Ps. And here are Dragons answers to these questions! How many years have you been running international programming for students? Over 25-years. What is the maximum number of students in each of your groups? 12 students. What is your ratio of instructors to students? 1:4 or one instructor for every four students. What are the typical professional qualifications of your staff? Do your instructors speak the local language? They are experienced, career, professionals! Typically, when a Dragons instructor team heads into the field they collectively represent multiple languages, ten or more years of in-country experience, and years managing student groups abroad. How many of your staff return year after year? We have a large number of return and veteran staff, with an annual return staff rate that typically hovers between 60%-90%. How do your proactively manage risk on course? See our Risk Management page. How do you manage an emergency?​ See our FAQ page. What type of emergency response team is on-call at your offices? With Administrators based domestically and internationally, our support team—with acute attention to the safety and security of our participants—is on-call 24/7 while students are in the field. Are itineraries fixed before the program? Are they the same from season to season? Every program is custom-crafted and unique! Dragons itineraries are flexible to create space for unscripted, serendipitous, and candid moments of surprise and discovery. Learn more about what makes us different. What tools do you use to facilitate reflection and dialogue on course? How do you foster a safe student dynamic? This is a great question to ask of one of our traveling instructors. You can request a home presentation and meet one! How do you define ethical travel? See our About Dragons page. How do you approach the theme of “service” and manage the dangers of “voluntourism”? See our Position Paper on Service Learning. How do you manage the sustainability of your programming on local communities? See our Position Paper on Responsible Travel. How do you help students apply what they've learned abroad at home? See the Transference section of our Blog for examples! What does your financial aid program look like? Here's all the details on our financial aid program. Can you put me in touch with an alumni student? Absolutely! Just send us a note requesting references to past students! 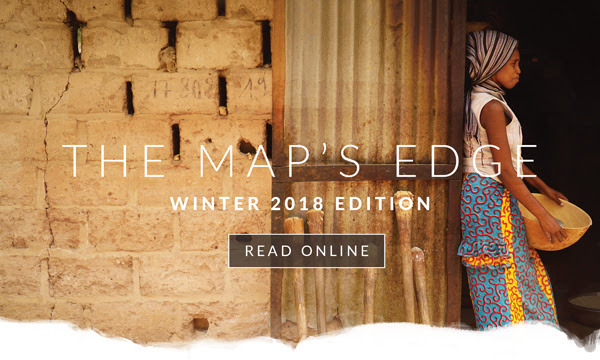 Here are some sneak-peek excerpts from the featured essays of our winter edition of The Map's Edge. Be sure to check your mail to get your hands on all the glossy pages of stories, photos, and updates from four corners of Dragons global community! "I believe that there are qualities in each of us that can only be realized in different contexts. I discovered that Brazil brought out a version of myself that inspires me most. To this day, I miss the candor with which I greeted strangers on the street and told them about my love for acarajé, the fried bean fritters I'd eat with friends after hours of practicing Portuguese. 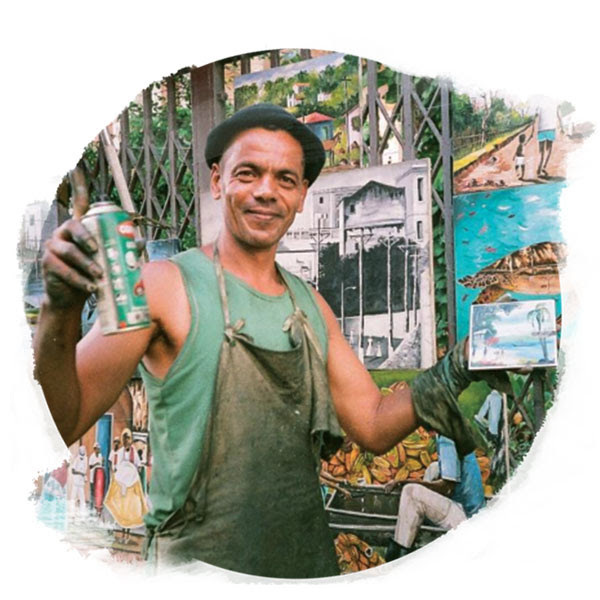 I miss the music and the visual arts that flourish across Salvador, and the days I painted lampposts with spray paint oozing down my hands. I miss the confidence with which Bahians wear their own skin, and the way I felt more comfortable in my own body than I'd ever been. More than anything, I miss the people who greeted me with a "seja bem-vindo" (be welcome) and bid me farewell with a "volte sempre" (return always). People who taught me that home can be anywhere in the world, as long as there are people with space in their hearts." 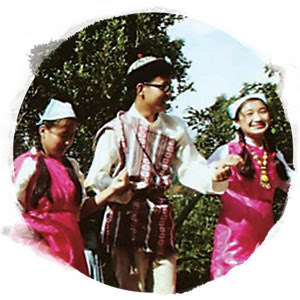 "The Lepcha believe their people originated within these valleys. They call themselves 'Mutanchi Rong Kup Rum Kup,' which translates as 'Children of the Snowy Peak and Children of God.' The Lepcha are nature worshippers, whose religion blends animism and shamanism and is called bongthingism, or Munism. The tribe shares an inextricable relationship with nature as evidenced by their vocabulary, which contains one of the richest collections of names for local flora and fauna recorded anywhere, and reveals a vast knowledge of naturopathy as well as holy texts. By some estimates, there are only 40,000 Lepcha remaining in Sikkim; their language is quickly disappearing and they are fighting to preserve their lands and what is left of their culture." 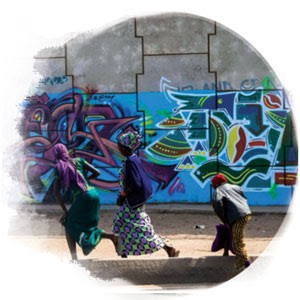 "I was hesitant to bring my camera with me to Senegal. I suppose I approached photography with more of a moralist's stance than a scientist's, and I felt some intuitive distrust of images and imagemaking as it related to my educational experience. I worried about the fraught relationship between subject and photographer. I didn't want to reproduce clichés and reduce people to flat, aesthetic purposes. At the same time, I wanted to remember what I would experience, and the fear of forgetting eventually overcame other qualms about the medium. I brought my camera, and I am both glad and regretful that I did." 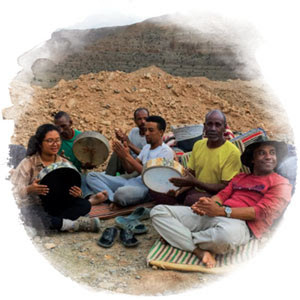 "...after hours of trekking, Ben M'barek would take out his drum, sit on a rock and start playing whatever came to mind. He never thought his songs would attract the attention of tourists who didn't understand a word of the Tamazight language. [...] The guide explained that M'Barek was singing about his love for the High Atlas Mountains and that he hoped not to see what might be hiding behind them. The oxygen of his life, its meaning, flows down from the peak of the highest mountain to his soul through the drops of rain and flakes of snow-pure and white as his heart, and imbued with love for this region, which to him is heaven on earth." If you didn't get one in the mail, here's the full digital issue! [post_excerpt] => Here are some sneak-peek excerpts from the featured essays of our winter edition of The Map's Edge. Be sure to check your mail to get your hands on all the glossy pages of stories, photos, and updates from four corners of Dragons global community! [description] => Featured International People, Places, Projects. [category_description] => Featured International People, Places, Projects. [description] => Featured Student Alumni and their projects/organizations/visions. [category_description] => Featured Student Alumni and their projects/organizations/visions.